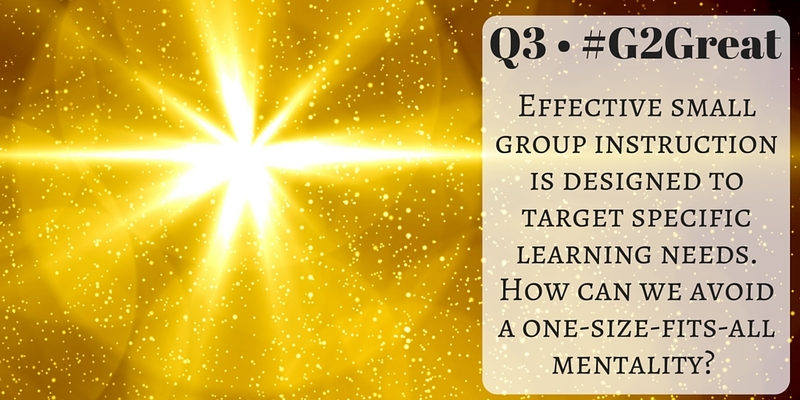 On 2/25/16 #G2Great continued our five part series, Holding Tight to the Practices That Matter as we turned the spotlight on small group instruction. The potential for small group instruction is high as it creates a structure that will form a habit of reading within an intimate setting where teachers can address the specific learning needs of students that would not be possible in larger settings. Of course, achieving ‘power potential’ assumes that teachers have deep knowledge of both literacy best practices and the children sitting at that table. This power potential of small group instruction was illustrated in the descriptive words of tweet after tweet such as: engaged, focused, responsive, individualized, targeted, strategic, flexible, fluid, purposeful, intentional, productive and joyful (my personal favorite). These descriptors reflect small group instruction at its best with practices grounded in meaningful experiences that engage students in reading writing and talking in ways that put them squarely at the center of our efforts. Passion rose high for the issue of one-size-fits-all small groups as it defies the descriptors above that represent the opportunities our students deserve. As I travel across the country I have become increasingly concerned that small group instruction in far too many classrooms can feel akin to an obligatory cattle call where a death grip on levels label learners and tether them to those one-size fits all small group experiences we are trying to avoid. What makes Sam’s tweet so compelling is that the potential for the very practice that elevates the learning lives of children can also have the opposite effect. We can only create the small group instructional experiences that are worthy of our students by maintaining a spirit of differentiation with a flexible lens of small group variations that may or may not include leveled books and may or may not rise from a single title. The type of small group we choose depends on our instructional purpose and the best way to meet the individual needs of each member of the group based on ongoing formative assessment leading to informed teacher decision-making. Why would we opt for anything less? The power potential of small group instruction is not about our decision to do small groups but our choice to create powerful, meaningful, and engaging small group instructional experiences. These rich opportunities allow us to intensify our instructional efforts as we maximize each child’s role as enthusiastic, capable, and confident learners who continuously move along a success trajectory toward their personal potential. This lofty goal is only achievable when we CHOOSE to flexibly and intentionally create more student centered small group experiences designed in a spirit of instructional excellence. I think achieving the power potential of small group instruction is a choice worth fighting for! I really appreciate these reflections of shared conversations in #G2Great chats. Currently, I am taking a class on the nights of your chats so having a way to go back to see what was discussed is helpful. I have enjoyed the topics and the community conversations. I especially appreciate your willingness to take a moment to synthesize the discussion and share reflections to push our thinking. I loved this quote, “We can only create the small group instructional experiences that are worthy of our students by maintaining a spirit of differentiation with a flexible lens of small group variations that may or may not include leveled books and may or may not rise from a single title.” It is one worthy of consideration. It is easy to find ourselves going through the motions of small group instruction, and forgetting that this is one way to support readers. By keeping our small group instruction intentional, maintaining focused instructional points, being flexible in grouping and choosing appropriate scaffolding (is it guided reading, strategy instruction, book talk, etc. ), we can support readers as they take new steps. Beautifully said, Cathy. We can no longer afford the lock-step small groups that have become far too prevalent. Without small groups that keep kids at the center based on our willingness to maintain a sense of flexibility – it’s just another thing we do out of compliance. Our choices must always be grounded in our responsibility to elevate the literacy lives of the very focus of our efforts – our students! I was delighted to feature Sam Lester. I saw him at NCTE and was so incredibly impressed. 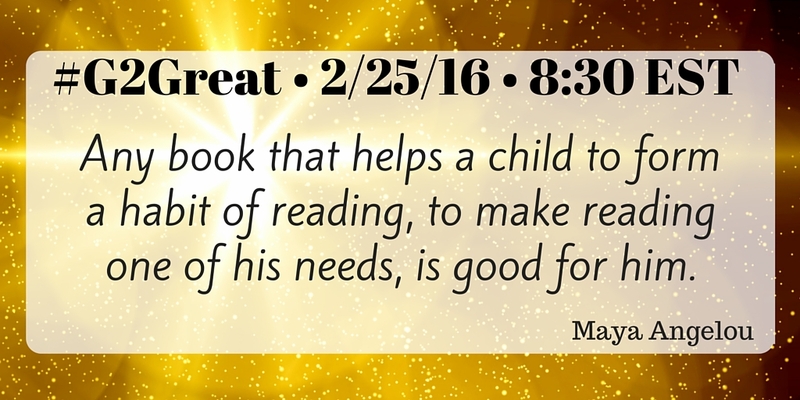 In fact, Sam is going to be our guest host at #G2Great later this year. We believe he can teach us a great deal. Quite a remarkable young man indeed!